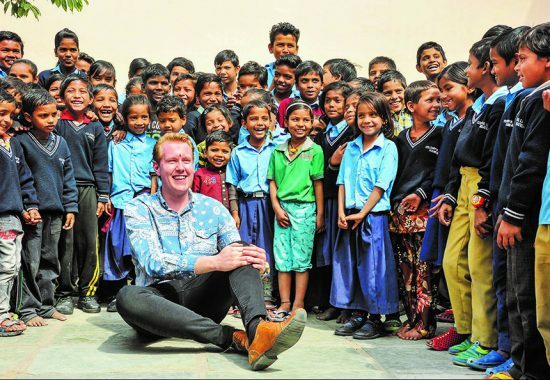 During a recent trip to India with Gemporia, Gem Collector presenter Alex McKay visited our Colourful Life Foundation India’s first completed project. The latest school we are sponsoring in Jaipur stands out brightly with its freshly painted walls and new welcome sign, a far cry from the dilapidated buildings surrounding it. Just six months ago, the Government Middle School in Bais Golam was all but a ruin, with a leaking roof, worse for wear toilets and classrooms which hadn’t been updated in over 20 years. With pupil attendance at an all-time low, the headmaster approached our offices in Jaipur, which are located just 200 yards away, for help. The cry for help fell upon our Managing Director, Sharmil Mathur. She was quick to visit and was shocked to find that a school so close to our offices was in such dire conditions. Sharmil realised this should be the next project for the Colourful Life Foundation, India. Within just two months, the school has been completely renovated, with new toilets, new food preparation area, the leaking roof fixed, new desks, as well as shoes, uniforms and stationery for all the children. Schooling in India works very differently to what we are used to seeing in the UK. The government’s educational remit only stretches to the supplying of teachers and daily food for pupils. The condition of the school buildings is left to the local residents and businesses, however many schools, like the one I visited, are located in poor areas, leaving little hope for local donations. Quite simply, without the incredible efforts of Sharmil and the Colourful Life Foundation, the school wouldn’t be the great centre of learning that it is today. The headmaster was pleased to inform me that since our support for the school began, the attendance ratings had gone from 62% to 85% and that the number of pupils had gone from 69 to 156. This school is now a real success. I was sad to learn that many Indian families place more importance on educating their sons than their daughters, often sending boys to private schools and girls to the local government school. These schools are usually drastically underfunded and in poor condition, which means that girls will begin their lives at a disadvantage compared to their male peers. Along with the schools we already support, this Bais Golam school stands as a shining example to those who walk through its gates, telling them that no matter what race, religion or gender they are, they have a real chance to learn and prosper.